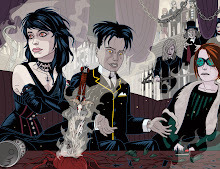 Having tarried over Patrick Wright's superb war comics, it is time to return to the convoluted narrative of dark doings in Fleet Street and Ms Modesty Blaise. Modesty Blaise must rank as one of the best U.K. newspaper strips ever. The combination of Peter O'Donnell's script and Jim Holdaway's stylish and dynamic artwork was truly a marriage made in heaven, but Holdaway's sudden and premature death in 1970 robbed O'Donnell of not only a great friend but also, as he saw it, the best artist for Modesty Blaise. Whilst Patrick Wright was working long hours on modestly paid work for IPC and DC Thomson, a succession of strip artists at the top pf their game had tried to fill the Holdaway void. 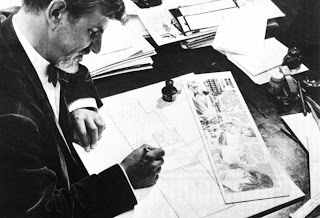 Enric-Badia Romero made a sterling effort for eight years, but feeling that he wanted to carve out a more distinctive niche for himself rather than being forever caste as the inheritor of Holdaway's mantle he left the strip to develop his own character Axa with scripter Donne Avenell. John M Burns then picked up the baton after being selected by Beaverbrook Newspaper Group editor Gerald Lip. Burns, whose work on Wrath of the Gods some fifteen years earlier had undergone something of a transformation from OK'ish to truly superb had according to some observers achieved this renaissance by the artist immersing himself in the study of Holdaway's use of line and strong sense of design and layout. Burns proceeded to turn in some really first rate work on O'Donnell's scripts. But whilst Lip and O'Donnell might have been pleased with Burns work, there were other players to be considered and Lip received a call from one of them. Charles Wintour was the editor of the Evening Standard and in terms of influence and patronage, one of Fleet Street's big beasts - essentially what he said was that he wanted Burns off the strip a.s.a.p. The reasons for this have been mulled over, but it seems that there was not a problem regarding the quality of his work on Modesty Blaise. Whatever the reason, Wintour was implacable saying telling Lip, "I want this artist out of my newspaper!" As Lip re-engaged with the vexatious task of trying to secure yet another artist who would match the expectations of O'Donnell, Wintour, and numerous other vested interests, not least of which was the strip's readership, he did what a lot of other harried editors in such a bind have done, he picked up the phone and made a call to Barry Coker of the Bardon Art Agency. and many thanks to the Comic Art Fans site for sourcing these images.